The grove consists of approximately 1,540 acres in the Sierra National Forest. Currently there are about 100 mature sequoias mixed in a forest of pine, fir and cedar. General Land Office. It was not until 1937 that the name Nelder Grove appeared on Sierra National Forest maps. The creek that flows through the campground is now called California Creek, but it was originally called Nelder Creek. The creek that flows through the Shadow of the Giants trail, is now called Nelder Creek, but it was originally called Alder Creek. Nelder Grove is a natural habitat for wildlife: black bear, mule deer, weasel, raccoon, gray squirrels, ground squirrels and flying squirrels to name a few. Bird life also favor the area: tanagers, juncos, sparrows, hawks and at least three different species of woodpeckers. The spotted owl is rarely “spotted,” but can be heard. Two historical cabins have been moved to Nelder Grove from Biledo Meadow. Lady bugs and monarch butterflies migrate through Nelder Grove. Numbers in parentheses signify how many mature sequoias are in each group. The U.S. Forest Service acquired the land from the Madera Flume and Trading Company in 1928. The first inhabitants utilized the area for gathering part of their winter food supply. They collected acorns from the black oak, as well as nuts, berries and many other native plants. The Western Mono believed the big trees were sacred and guarded by their guardian spirit the owl. The Western Mono called the Big Trees, “woh-woh-nah” after the call of the owl. John Muir and John Nelder meeting at Nelder Grove (Fresno Grove). This engraving was first published in Harper’s New Monthly magazine and Muir’s book Our National Parks. In 1849 John Nelder left New Orleans to find gold. He traveled west to California along with thousands of other gold seekers. 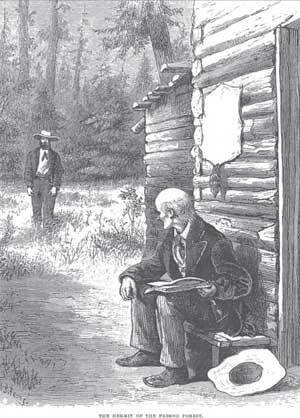 After growing weary of prospecting, he came to the grove in 1875 and built a cabin in the shadows of the towering trees. It seemed that after a life of searching, the true treasure he sought was not gold but the wonder of nature. Nelder lived in the grove for 14 years, making shakes and souvenirs from the sequoia bark and red dye from the sequoia cones and seeds. In 1889 his cabin burned down and he passed away shortly thereafter. The California Lumber Company started working in the area about 130 years ago near the current “Camp Redwood” and Gooseberry flat area off Sky Ranch road. The Madera Flume and Trading Company successors, the California Lumber Company, operated Mill #2 (1879-1884) in the lower meadow on California Creek. Lumber was processed at the mill, piled for drying, and then later put into a flume at the end of the meadow, and sent to Madera, California. Bundles of lumber would float down the flume to Madera, a distance of 52 miles! 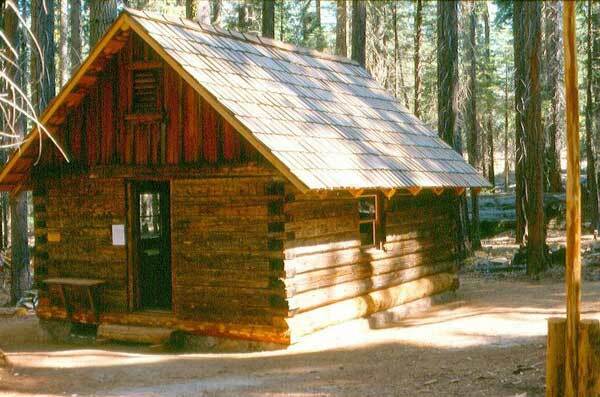 From 1888-1892 California Mill #4 was located within Nelder Grove near the campground. Most of the lumber harvested was not from the sequoia tree, but was primarily sugar pine, ponderosa pine, white fir, and cedar. The sequoia tree does not make good building material. When the sequoia tree falls it is very brittle and often breaks up into many pieces. Only a small section near the base of the tree does not “splinter” when it crashes to the ground. Estimates of the amount of wasted wood from logging operations of sequoias, primarily due to splintering, were as high as 75%. 277 giant sequoia trees were harvested. After 1892 to the 1920s, most of the larger sequoias that were cut were utilized by post, grape stake, and shake makers because of its high resistance to rot. 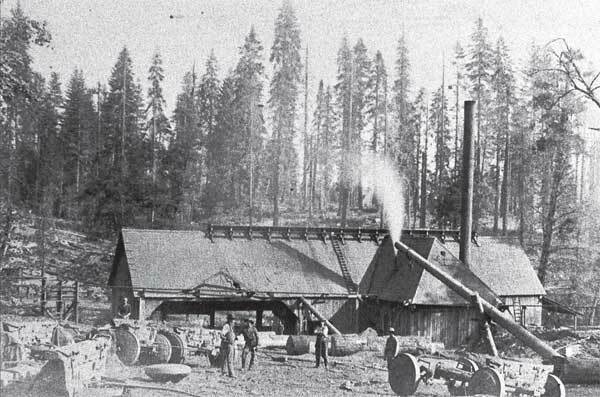 In 1899 Mill #4 was moved to Sugar Pine. Sequoia stumps you see today in Nelder Grove have been there for about 120 years. Harvesting of sequoias is no longer allowed within the grove and they have been protected for many years in Nelder Grove. Biledo Meadow is at an elevation of 7100 feet, on the southwest side of Mount Raymond in northeastern Madera County. Due to the snow load, and the desire to protect the cabins, these two were selected and moved to Nelder Grove in 1980-1981. Around 1982, during a wind storm, a tree fell and demolished one cabin roof. It was rebuilt the following year. The buildings, structures, and objects found at Biledo Meadow today are related to mining and pioneering activities that took place during the latter half of the 19th century and the first half of the 20th century. In 1929, Mr. Oscar A. Kelley, applied for a Special Use Permit to build Camp Beulah. The camp was created for disadvantaged children, most of whom came from the San Joaquin Valley area, some came as far away as the Bay Area. The camp opened in 1931. The average stay was two to three weeks. The children had access to a croquet court, took short walks to see the “Big Trees” and even hiked to Fresno Dome (about 5 miles away). In the campground area, there are two apple trees still producing tasty apples. These were planted by Mr. Kelley’s parents. Camp Beulah existed for only three short years. In the fall of 1933 a new law was passed stating that a registered nurse must be present at all times in any camp for children. The Kelleys felt they were financially unable to comply with the new law. In 1937 the family moved to Oakhurst and in 1938 the buildings in Nelder Grove were torn down. Found South of the Bull Buck Trail Head. In the meadow there are two walk-in campsites, as well as some nice specimen sequoia trees, a waterfall, and lots of insects and other wildlife.